When important operational decisions are released through media leaks rather than developed in an open, inclusive process, it feeds into the knee-jerk fear and cynicism that drives opposition to change. This past Monday, the Hamilton Spectator published an article on a leaked draft of the city's preliminary light rail transit (LRT) plan, which calls for a "transit first" approach that prioritizes LRT to maximize the speed and reliability of the service. Run LRT on two centre lanes throughout the McMaster University to Queenston Circle corridor except for downtown's International Village. Turn International Village from Walnut to Wellington streets into an LRT "Transit Mall" closed to other through traffic. Limit left turns to main intersections along the corridor, with side streets and private driveways restricted to right in, right out turns to minimize vehicles crossing the tracks. Make King Street two-way between Dundurn and the Delta. Create a single traffic lane running in each direction alongside LRT for much of the route. Segregate LRT from traffic with a vertical or mountable curb for emergency vehicles. Ironically, this leak comes a week before staff present an update on the LRT communications strategy to the Light Rail Transit Sub-Committee meeting on March 29. We can't link directly to the report, since the city's committee meeting website is broken-by-design, but the document is item 7.1 under Presentations. Rapid Transit is more than just moving people from place to place. It is about providing a catalyst for the development of high quality, safe, environmentally sustainable and affordable transportation options for our citizens, connecting key destination points, stimulating economic development and revitalizing Hamilton. That report emphasized the vital importance of broad and ongoing community engagement on the LRT project, which is large, complex and potentially controversial. In keeping with this, the objective of the communications strategy is to "build awareness of the project and process" by engaging stakeholders, undertaking market research and informing Hamiltonians about the approach and timelines. Beyond the Citizens' Jury, engagement will include a website, a project newsletter, social media, LRT Sub-Committee meetings, briefings with councillors, meetings with BIAs and the Chamber of Commerce, meetings with neighbourhood associations and community councils, media interviews, pop-up displays at public events, telephone town halls, media ad buys and a Light Rail Vehicle display. LRT is an integral part of a comprehensive economic development strategy to attract new investors, create new jobs and broaden the tax base. LRT produces no tailpipe emissions and will help to increase transit ridership and reduce noise and air pollution. LRT will be integrated with the city's multi-modal transportation network, including transit, cycling, bike share and walking. 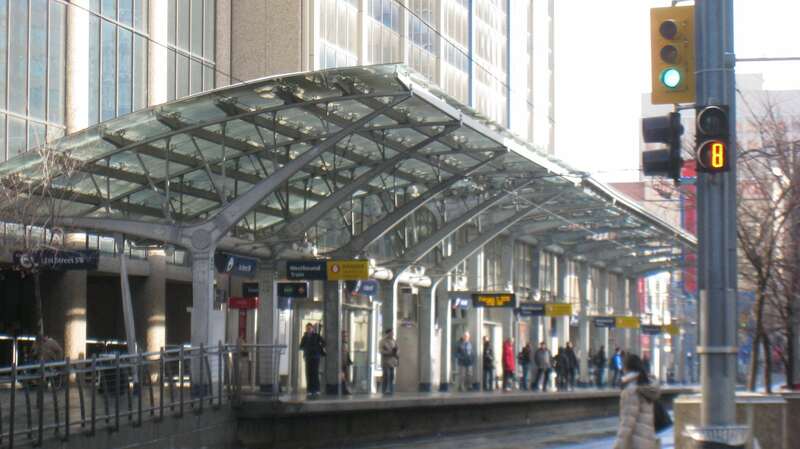 LRT will also be integrated with regional rapid transit by connecting to the Hunter Street and West Harbour GO stations. One of the first details to be presented starting in May will be a preliminary design of the amended LRT route - this is the leaked document that was reported in the Spectator - as well as confirming general stop locations and finalizing a maintenance and storage facility location. The goal is to visit every property and business along the LRT route between May and June, and to do this twice a year until the LRT is completed. The LRT team will maintain a database of contacts and feedback on operational and other issues. The City completed an Environmental Assessment (EA) for the original LRT route, but that needs to be amended due to the changes in the final LRT route, specifically ending the line at the Queenston Traffic Circle and extending a spur north to the West Harbour GO Station. That EA Addendum will be completed between September 2016 and Spring 2017, and will include a formal process to provide input with Public Information Centres (PICs), stakeholder meetings and telephone town halls. In a refreshing line, the communications team will also "go where the people are" by visiting public events, trails, bus stops, go stations and malls. The EA Addendum engagement process should be completed by Spring 2017. During the pre-construction phase in 2017 and 2018, the communications strategy will be to prepare the public for the impacts of LRT construction. That will include preparing a "business support toolkit", marking the route to identify station locations, support for trip planning (similar to the tool the City developed for commuters during the Beckett Drive closure) and fully-staffed community offices to meet people and answer questions and concerns. The strategy recognizes that LRT construction will be disruptive to local businesses and is "committed to mitigating the impacts of construction, where practical." That will entail professional training opportunities, market research, advertising and a business support program. Metrolinx also pledges to work with community organizations to ensure that local benefits include jobs, apprenticeships and "social procurement," which means taking local social benefits into consideration when making hiring, purchasing and procurement decisions. Over the past few years, we have often lamented the fact that the City's Rapid Transit engagement strategy, so broad and inspiring in 2008, fell silent in 2011 when the project ran into political turbulence. As the months ground on, much of the goodwill the City had accumulated during its engagement heyday evaporated. 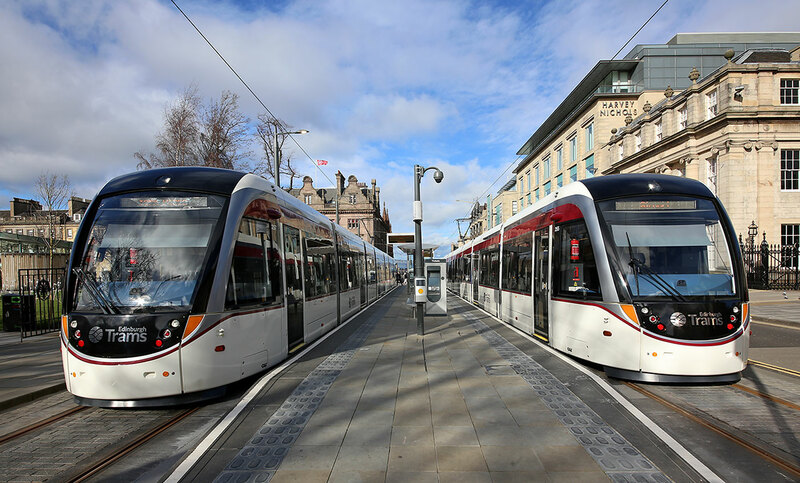 Confusion, misinformation and nonsense quickly emerged to fill the void, and the City remained silent in the face of a growing barrage of anti-LRT FUD. That cannot be allowed to happen again, and the City's LRT communications strategy comes not a moment too soon. If anything, it should have already been in place and under active engagement before we got to the point of having a preliminary design document to release - albeit as a leak to local media. The result is that the City has at least provisionally relinquished its own ability to frame its approach to LRT planning. As we have learned from other cities that have implemented LRT, it is vitally important for the City to be engaging with the public continuously through a variety of channels and formats to keep receiving feedback and building consensus. That way, when a controversial but important decision is at hand, there is political space for Council to make the right choice. If what the Spectator has reported is, indeed, the direction Metrolinx and the City are going, it looks like they are paying attention to the success criteria of LRT in other jurisdictions. That is encouraging, but even good policy decisions are better when they're made in a more public, inclusive way. This appears to possibly de-facto require a Main 2-way conversion, due to the pedestrian-only International Village. Problem to solve: Nicer pedestrian-optimized 3-lane 2-way Main with center turning lane might be capacity constrained (wider sidewalks and bumpouts) in a James Street North treatment of Main. Curb lanes with speeding cars could make walking on King more uncomfortable than today. Design elements will need to de-tune speeding on King. There will appear to be some compromises but lots of the hang-wringing by anti-LRTers are echoes of the people complaining about the James Street North 2-way conversion. This is going to frustrate a lot of car drivers (and possibly myself included) but I am extremely thrilled about the urbanization potential of making King/Main less attractive to cars -- increasing pedestrian/bike/transit use. This has happened in other cities, to great success. But as a car driver, I know this transition will be challenging. So that automatically means we don't /necessarily/ have to make both cycle-friendly and pedestrian-friendly, and technically, one of the two could become the more pedestrian-friendly. This might mean ONE of the streets will have a status quo of today's narrow sidewalks, and the other streets could be MUCH more pedestrian friendly. While I'm mixed on this, this is definitely (for me and many) far better than today's status quo, in my and many other people's opinion, although there are many who do not agree (In fact, there are dissenting opinions even among LRT advocates, how Main and King should be treated) -- this post is my own personal opinion only. For myself (and apparently, many near me), I will be happy to tolerate taking 5 minutes longer to drive to the 403, if it means James Street North on King/Main between DT-Gage with nice sidewalk/cycle/transit(LRT) infrastructure, more jobs, vibrant businesses, and no shuttered store fronts. Many of us are in! I would be amazed to see the City change both King and Main to two-way in the next decade, but if it happens, it will likely be foretold in the new TMP, which will include a priority initiative phase to review all the one-way streets in the network and determine conversion priorities, benefits, impacts and costs of same. Combined with new streetcars, conversion to pantograph operation (not trollypole), and green traffic-signal transit prioritization, the downtown portion of the 504 King streetcar, could finally begin to function much closer to a real LRT modern than a traditional streetcar. Not the whole 504 route would be dedicated to streetcars, and the stop spacing would still be a nightmare, as will be traffic in the peripheries (e.g. Liberty Village), but if this happens before the Hamilton LRT construction, this could be a great textbook case study on how LRT-izing a streetcar greatly improves its performance. I hope Toronto properly pulls off their pilot project, before the Hamilton LRT begins construction, as Ottawa/Kitchener-Waterloo LRTs beginning operation before Hamilton LRT begins construction. King is narrower than Spadina, but it gives you the idea of how the street will function: 2-way traffic on either side of the dedicated LRT lanes. Crossing the street or turning in either direction will be possible at signalized intersections. Approaching King from a side street will allow you to turn right onto King. Our best local example now is York Boulevard from Bay to Dundurn. If you approach York at a signalized intersection you can drive in any direction. From a side street you can only turn right. Pretend the treed median on York was actually an LRT median. Exact same design concept will apply to King St once it has LRT. Presumably this will remain similar, just a slight different alignment. (2011 City/Metrolinx plan embedded in background of this slide of one of the Hamilton LRT citizen advocacy's presentations). Also, the fact you only need to cross ONE lane of now-tamed car traffic, will help. I'm actually more concerned about car traffic speeding adjacent to 1.5 meter sidewalks, than about people crossing to the stations (A concerned actually shared by pro/anti LRTers). I would like to see the city's car-taming plan. I'm pretty curious too, but let's wait till the new plans arrive. It is possible that the stations are totally rejigged at these locations. There are parking lots and asphalt (e.g. the gas station and the submarine place) that could be utilized, for example, to create enough temporary width for two LRT lanes, two traffic lanes, and a station, combined with sufficiently enhanced sidewalks. It may mean some loss of parkinglot land for some businesses (Metrolinx would obviously pay for such parking lot expropriations for any Sherman station, for example) and would pay for the costs of any reconfigurations (e.g. gas tank location for gas station at Sherman, unless the gas station moves altogether). Many places do not seem to have room unless station positions are jiggled around a bit (e.g. opposite side of an intersection) so we will have to see what the new plan is. I'm intensely curious, as you are too! Additional consideration: Consider Sherman station has a few interesting observations for development opportunities: Gas station, soviet apartment block, and a traditional parking-lot submarine place. It shows many existing construction near the stations are not heritage at all, and a low expropriation community-outrage risk. There is that older 60s-style soviet ugly apartment cube next to the gas station so presumably in 10 or 15 years -- both the gas station and that apartment could theoretically merge together into one hopefully tastefully-designed retail+apartment complex (four-five storey with setback at top? ), maybe even with a nice patio restaurant/cafe/bar/icecream. Ditto for the submarine place, which would no doubt love to sell out their suddenly-valuable plot of land for a development. This may mean a loss of parking but that parking lot is almost always empty (submarine place). When the plans are released, we'll know how many meters of parking lot needs to be expropriated. There is another gas station (Pioneer) down the street and fewer cars will likely use King, so it may be turned redundant, favouring a more appropriate development that covers city taxes better & fits well in the neighborhood. For this, I would hope for mixed-income developments, inclusive housing, or other form. Yes, this is why I liked the old 1-way plan. With a middle platform, pedestrians would only have to cross a lane of LRT rather than auto traffic, and 2 lanes of car traffic adjacent to each other would allow the curb lane to be parked cars. I wonder if vibration was the reason? LRT trains would only be a sidewalk away from some buildings. As a member of the old Rapid Transit Citizen's Advisory Committee, I would like to remind everyone that two-way conversion of Main and King was always seen by by both Metrolinx and the City as the most efficient way to combine the LRT with efficient movement of motor vehicles, and also to make lower city destinations easier to reach by car. 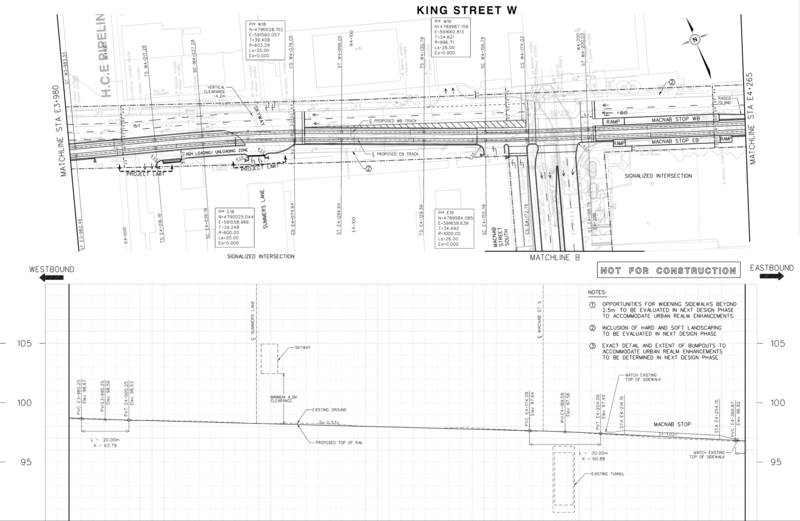 The 2010 Metrolinx Benefits Case Study and the initial design discussions all recommended two-way Main and King. Clearly, if you take one or two westbound lanes out on King it makes sense to add westbound lanes on Main to keep things balanced and make navigation easier for motorists. So why was two-way conversion taken off the table when staff and the consultants released their final design? As Jill Stephens point out in the meeting, it was a purely political judgement. Her feeling was that LRT was controversial enough and that adding two-way conversion into the mix would just make it even more difficult to get Council to accept LRT (despite the fact two-way is actually better for motor vehicle flow when combined with LRT). So rather than have Council get distracted by the highly emotionally and symbolic one-way/two-way debate the compromise decision was made to take it off the table pre-emptively. 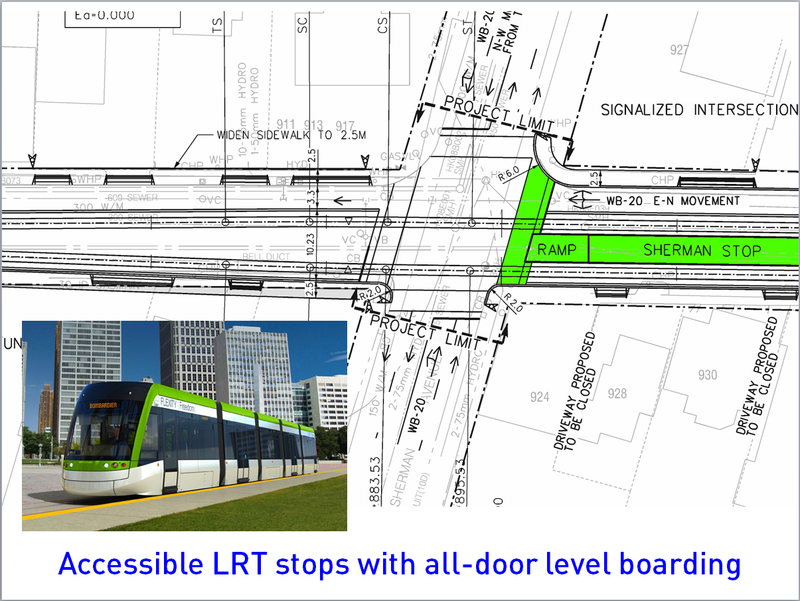 Things are different now: the decision has already been made by Council and the Province to build LRT (and the Province is paying the entire cost) so the focus now is getting the absolute best LRT design possible and still get good traffic flow. I'm not talking about two-way main, which is a much larger conversation, but two way King. King will be broken as a throughway either way. To me, the question is whether two narrow one-lane, one-way alleyways is more useful than a single two-lane westbound road. Plus, a one-way King would give them room to have more elaborate platforms since the road could be constricted to 1 lane if needed... a two way road does not have this option. Normally I'm all about two-way conversions because we're usually talking about converting massive unsafe 4+lane traffic sewers into normal streets. In this case, a 1-way road isn't going to be anything like that. I'd say the same for James too - given the various options, a 1-way 2-lane James with Street side parking (and lrt on the remaining 2 lanes) would be my preferred option, not because I'm excited about 1 way streets but just because this allows the road to still work as a place people can pull over and stop. In Hamilton many long-time residents like the major one-way arterials and minor arterials and their timed lights because it allows them to quickly drive right through the entire city, almost like being on a freeway. Combined with over-built street infrastructure and low congestion this makes it easy to drive long distances at high speed through the city. I remember a truck driver telling me that Hamilton is the only city where he drives through downtown as a shortcut instead of taking the freeway (e.g. instead of taking the QEW across the Bay, take Main St, or instead of 403/Linc/RHVP)! The one-way network, however, makes it complicated for motorists to reach destinations downtown (requiring a lot of loop backs and non-intuitive turns). The resulting speeding and narrow sidewalks with few crossings make for a poor pedestrian experience and make it difficult for urban businesses to succeed. So there has been a debate for at least the last 10-15 years about whether to convert some of these streets to two-way to improve economic vitality, navigability and the pedestrian experience (i.e. make the streets more complete). Council voted over a decade ago to convert many of the smaller streets, but never allocated funding. So any suggestion to convert major arterial streets like King and Main to two-way could be seen in this context, rather than as a necessary part of improving traffic flow and economic vitality during and after LRT construction. King with two westbound lanes, one of which would hopefully still allow for parking off rush-hour, would hardly be the kind of traffic sewer we normally talk about when we discuss 1-way streets. Main Street is that argument. King with an LRT is not. I'm glad you pointed out the tremendous irony in that a leak occurred about the possible version of the final form of the LRT right of way just as the LRT project communication plan update was going to be presented. That little laugh a side, its now the dangerous time for the LRT project. This is the time the anti LRT crowd will come out to start their campaign to wreck the progress so far, be prepared. That leak was probably by someone on council who is against the project. I listened to the broadcast on CHML about the progress so far. To me, Mr. Paul Johnson seemed more than a little "pissed" that there was a leak while work was incomplete and still being massaged worked on into a final design and operating plan. This leads to my belief that it was done by someone against the project just as the most controversial parts are being worked on. By controversial I mean, controversial to the people most against the project and any possible change this LRT system will force on the road network. The sense of timing is too good. So watch out guys, the anti LRT crowd is about to start to gather! "There is no transit reason to build LRT." Imam al-Ghazali said "all the strife in this world is due to three people: a newscaster, a news seeker, and a news listener". So ... the entirety of King Street would be two way except for Dundurn to Paradise N ... i.e. the bridge over the 403 and a little bit on either end. This seems bizarre. Granted, the Province would need to be involved with converting this last stretch since the 403 ramps would be involved. But the province is involved ... the the tune of $1,000,000,000+. Including a new bridge over the 403 for the trains. Funding is based on the proportion of ridership in Canada. 2.44% of annual transit rides in Canada are taken in Hamilton (22 million rides in Hamilton). Ontario and quebec will get 71% of the funding because they have 71% of the rides.